Vektanova - What did Ancient Mars Look Like? Education Gallery Gallery What did Ancient Mars Look Like? 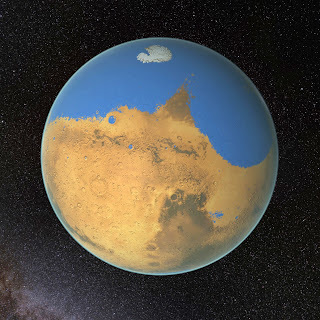 What did Ancient Mars Look Like? For decades, planetary scientists have suspected that ancient Mars was a much warmer, wetter environment than it is today, but estimates of just how much water Mars has lost since its formation vary widely. Now, new isotopic measurements by researchers at NASA's Goddard Space Flight Center reveal that an ocean once covered approximately twenty percent of the Martian surface. This new picture of early Mars is considerably wetter than many previous estimates, raising the odds for the ancient habitability of the Red Planet. Title : What did Ancient Mars Look Like? No response yet to "What did Ancient Mars Look Like?"